Virtual New Zealand Stamps: 2016 Christmas. 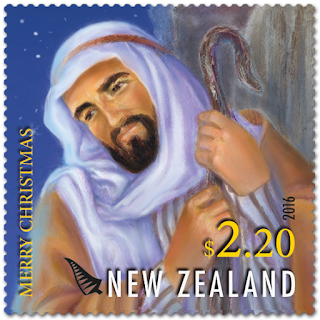 Every year since 1960 New Zealand has issued special stamps for Christmas. Originally this was a single stamp but more recently has become a set of five or six stamp plus adhesives. Usually, this occurs much earlier, late October or early November, so mail carrying these stamps can reach their overseas destinations by Christmas day. 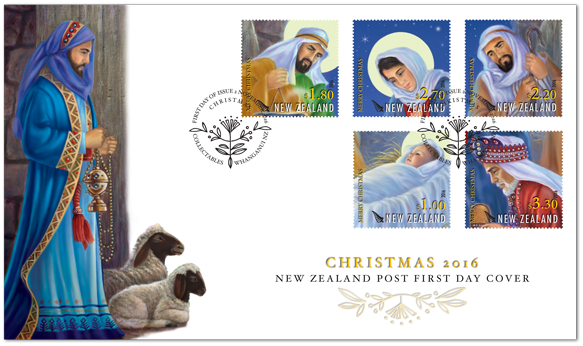 The 2016 Christmas issue featured five values showing five people from the story of the birth of Jesus Christ. It's a wonderful story, displayed with bright colour in five different images that, as we will find further down this page, become part of a much larger picture. 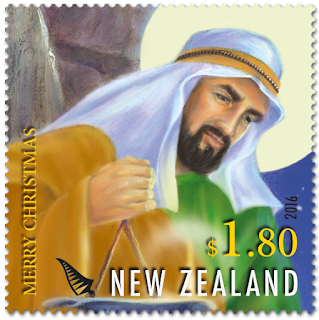 Three of these stamps were also issued in an adhesive format for those who wish to buy larger quantities of these stamps. 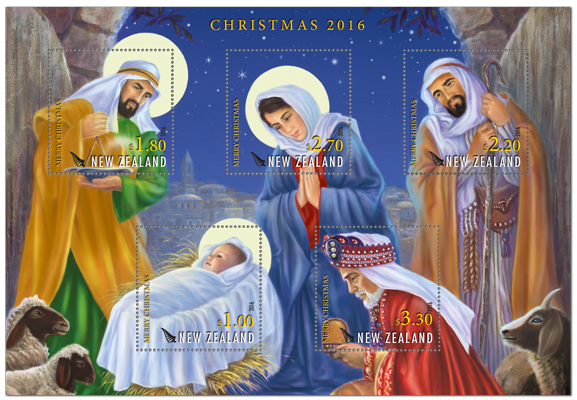 The five values of the 2016 Christmas Issue. I want to do something a bit different with this post. Rather than just telling the story again, as been done so many times in past Christmas issues, I want to go back to the original version, found in God's word, the bible and use scriptures to tell the story with the stamps used as illustrations. their marriage until she gave birth to a son. And he gave him the name of Jesus. their own town to register. to him and was expecting a child. him in a manger, because there was no guest room available for them. has happened, which the Lord has told us about. was lying in the manger. 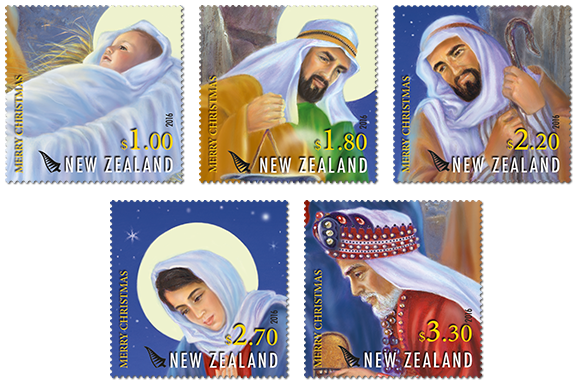 The miniature sheet incorporated the five stamps into one scene. First Day Cover for the five gummed stamps. 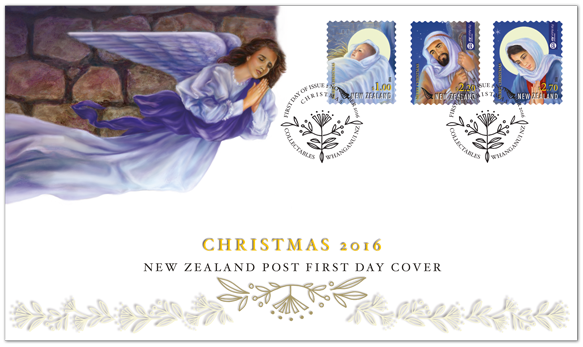 First Day Cover for the three adhesive stamps. 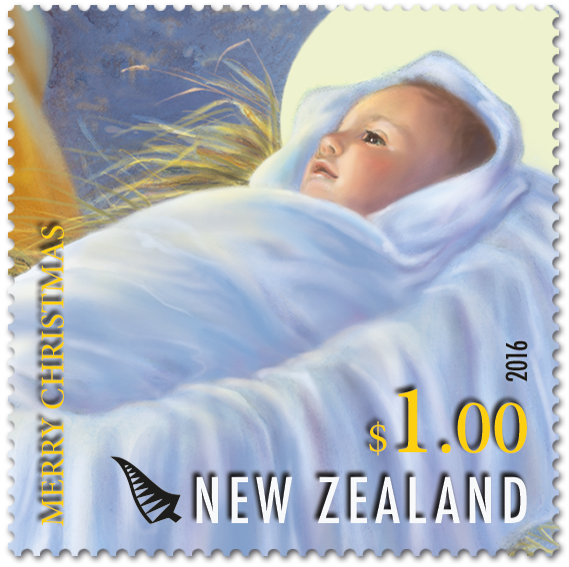 First Day Cover for the miniature sheet. 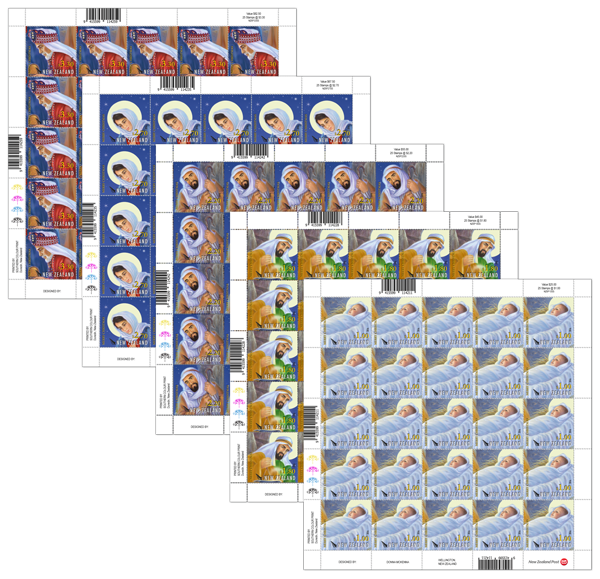 Three of the gummed stamps were also issued in an adhesive format. They were used in the booklets and dispenser that came with this issue. 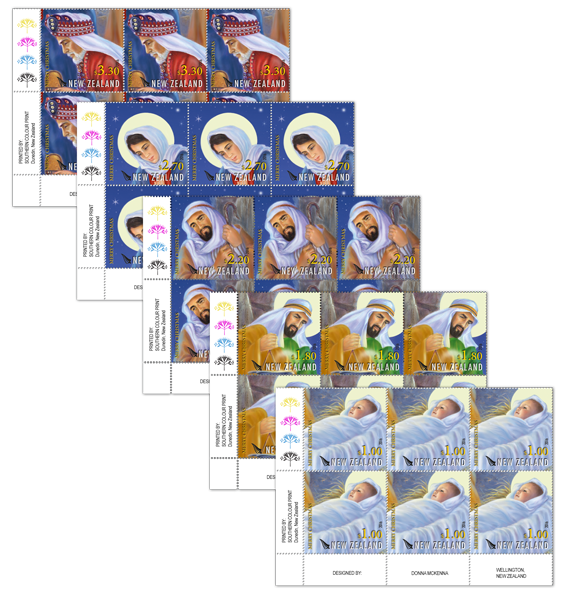 Above are the three booklets for the three separate values, each containing 10 stamps. 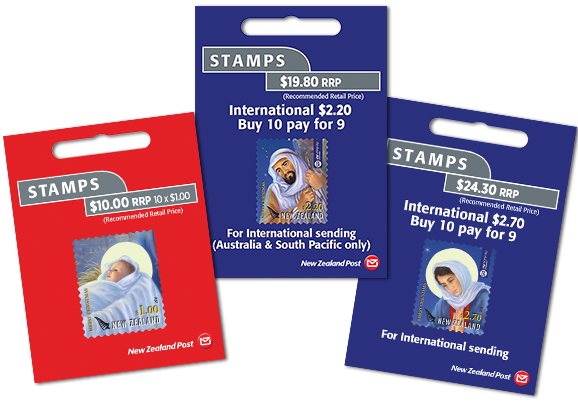 The two $2.20 and $2.70 international booklets feature a ‘Buy 9 get 10’ offer. 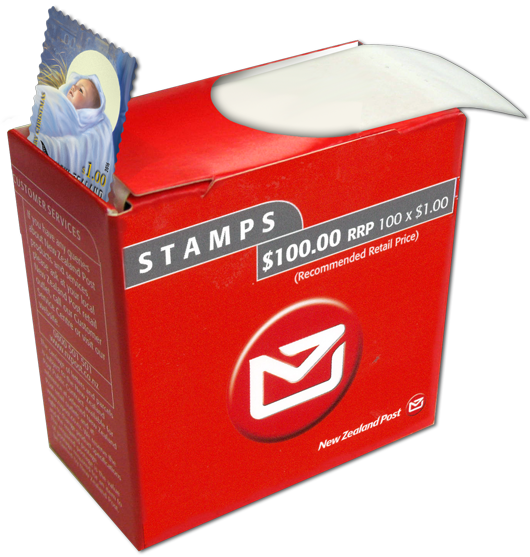 Below is a dispenser box containing 100 x $1.00 stamps. As is usual with most NZ Post issues, there are the items, especially supplied for collectors. 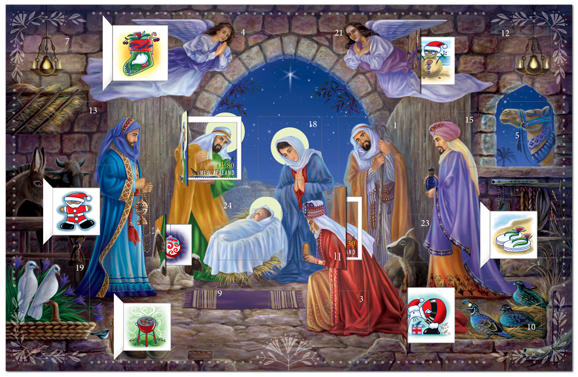 "An advent calendar with a difference." I don't know what to say about this item so I'll let NZ Post tell you. "The nativity scene is expanded further on a very festive collectable - an advent calendar. 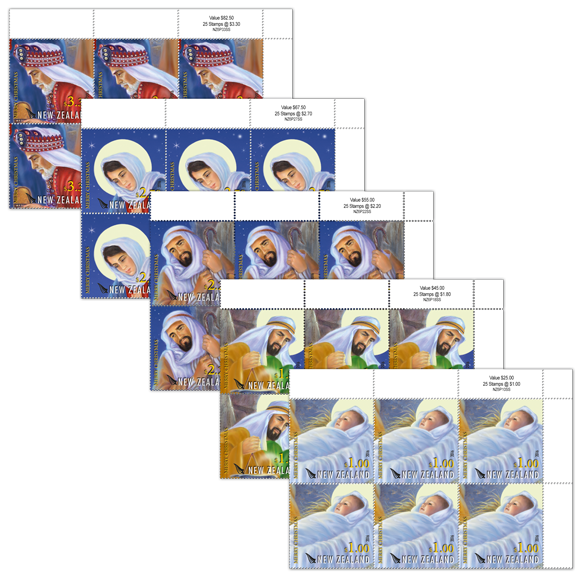 Complete with a stable and animals, the advent calendar is a unique gift for children, grandchildren and the young at heart. 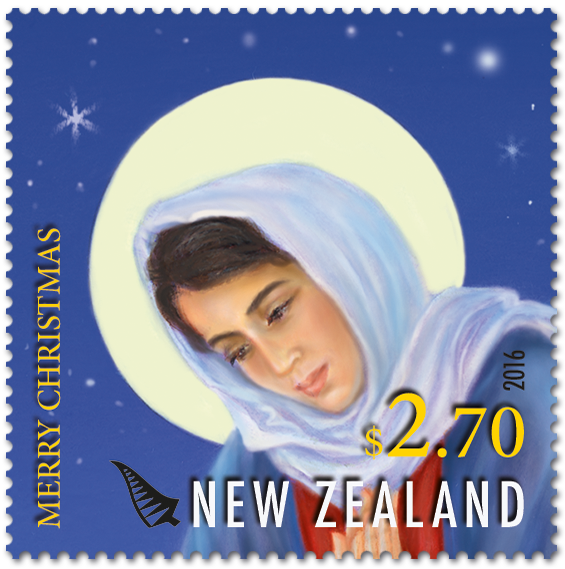 Use it to countdown to Christmas day and behind each of the pockets, you’ll find a charming New Zealand Christmas illustration. 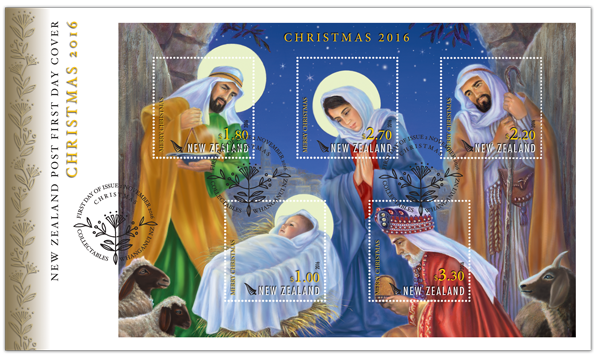 Best of all, behind five of the pockets, you’ll find the five Christmas gummed stamps! Keep them as a beautiful collectable or use them on your Christmas mail." 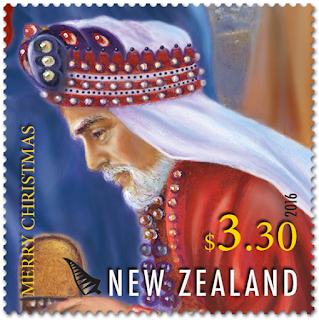 NZ Post Website. Looks good Kim. I rather like the scripture idea. Well done Kim. I like the scripture idea. I don't think that has been done before on this blog.